Last year, Kestrel and I visited Cuba. It was one of the most amazing places I have ever been to. We met the most hospitable, humble and fun people and saw the most gorgeous pristine lands. Everyone we talked to along the way shared their questioning of what Cuba would look like without Fidel Castro. Everywhere you went in the country, there were political signs that made you feel like Castro was right there with you. I pulled some of my favorite photos from the trip. If you want to visually take a trip to Cuba, scroll below. Stories that accompany the photos were written by Kestrel. “Long Live Free Cuba”, a sentiment that dates back to the 1959 Revolution led by Fidel Castro, Raúl Castro and Che Guevara, paints the streets from the cities to the pueblos. Whether the saying has undergone semantic satiation is unknown. Gracing walls, billboards, and rural roadsides, words of the revolution era remain a significant part of everyday environments in Cuba. As we wandered the streets, we questioned whether the repetition has removed some of the original meaning or instead instilled a greater sense of national pride. Airing out the laundry. This was the typical balcony scene on the old buildings. When landing on Cuban ground, our first stop after the airport was: Candy’s house in Cojimar, a smaller village on the outskirts of Havana where Ernest Hemingway used to keep his boat. The global platform AirBnB had directed us to this oceanfront location. New to Cuba, AirBnB’s presence reflects a significant shift in Cuba’s economy. Since Raúl Castro took the reigns from Fidel in 2008, he has gradually shifted the country’s economic model to include private business. An occupation previously impossible, entrepreneurs now make up an estimated 40 percent of the workforce according to Bloomberg Business. A writer, traveler, and chemical engineer, Candy is one of those private business owners taking matters into her own hands, getting creative, and using property as a way to access a newer source of income. While we were taking a cross-country bus, I noticed this youngster looking out one of the windows of a neighboring bus. Our first culinary experience in Baracoa proved more flavorful than our first few days on the island. Through a referral from Maídelin at our casa particular, we discovered this seaside spot. Costa Norte is a paladar, or privately owned restaurant, which is another venture option for Cuban entrepreneurs. Fresh fish and octopus cooked in Baracoa’s signature spicy coconut milk sauce, fried plantains, a plate of avocado and an ocean view tasted even better with the opportunity to support a new generation of business owners. While gazing out at the morning street scene, Drew captured this voyeuristic moment. A relatable experience, this family enjoys their breakfast ritual. While the media often glorifies the dilapidated buildings across Cuba and other parts of the developing world, people live behind the walls of these structures. A family engaging in their daily routine, just like many of us do, yet amidst a very different backdrop than most of us can imagine. Much of Cuban life outside the city was a throwback. These roads led outside of Baracoa, where residents would hike their daily needs back into the mountains. Often, taking the road less travelled can lead to far more rewarding experiences. We were fortunate to meet this construction worker along one of those alternate routes down a back alley road. Connecting with he and his fellow workers, hearing stories of their friends and family who have moved to the U.S., and snapping photos together brought us the simple joys that travel breeds. When we parted ways, José left us with a wholehearted farewell: “Yo deseo todo el mundo por los dos.” I desire all of the world for you two. He requested that upon our next visit to Cuba, we stop by to see his finished home, and bring along our photo of him from that day. One of Cuba’s top 3 homegrown products is rum. After its original rise to popularity in the late 1800s under the Bacardi family name, a fallout with the Castro regime led Bacardi to relocate to Bermuda. Today, it’s Havana Club that takes the sugarcane cake. Used for daíquiris, mojitos and piña coladas, the local celebrations often involve just a bottle of the pure stuff. This crowd was celebrating the señor on the far right’s birthday. Without needing to murmur any actual words, we repeatedly heard the whisper of advice in Cuba to take a moment and celebrate life. Our reflections from a single trip to the Caribbean’s largest island are expansive. Potentially, this in itself, is a semblance of the inexplicable phenomenon that is Cuba. A country with deep history in conflict and rooted in revolutionary endeavors, Cuba is complicated. As is the rest of the world. But when all of the unintentional categorizing and overthinking subsides, the strong human spirits rise to the top. In the end, it’s the people you meet and the stories they share that bring life and soul to the journey. A family walks back toward town from the beach. Baracoa, Cuba. A fisherman walks back to Baracoa, with his bounty in hand. Grandma Fuentes, the matriarch of the farm, had an exceptional calm about her presence. She welcomed us and exchanged several smiles as we enjoyed fresh fruta bomba (papaya) and coconut at the family’s home. Wisdom emanated from her. A son of Señor Fuentes, Junior runs hiking tours through his family’s farm. Set on the outskirts of Baracoa, their finca is nestled beneath a massive cave system of coral, an area that was historically underwater. The Fuentes farm adventure leads visitors up above the tree line through a makeshift ladder and cave trail system, arriving at the La Cueva de Aguas, a natural swimming pool. 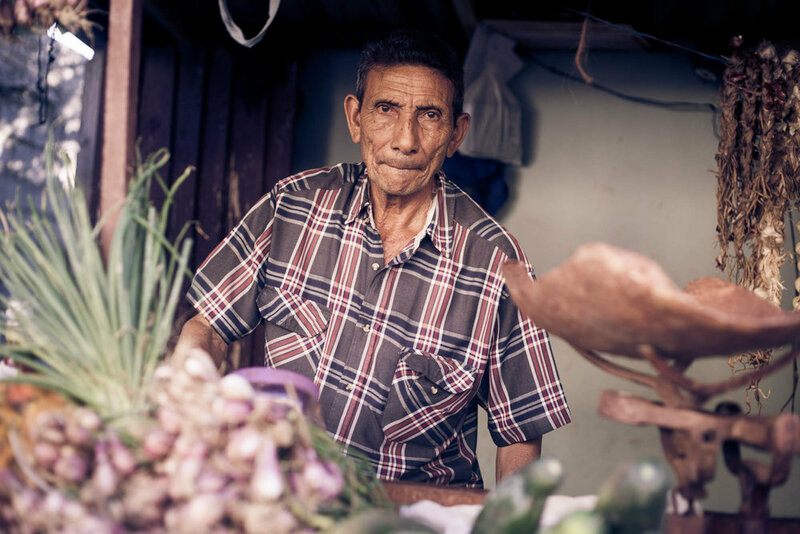 Serving as a tour guide, Junior can share his knowledge of the region’s history, the farm, and the mountain village, in exchange for otherwise inaccessible capital. This boardwalk connects the beach with a river town outside of Baracoa. A young fisherman perched along the floating docks outside Baracoa. Not many places can match the view of an island sunset. This is taken from one of the most eastern points of Cuba. On a clear day, you can sometimes see Haiti. José, the head of the park rangers, and his colleague shared with us a realness, a rawness. During Angola’s civil war, the Cuban military was sent to fight alongside the People's Movement for the Liberation of Angola. José was one of those men sent on the 1980s mission. He told us that the conditions were horrible and they could rarely find food. By sharing his struggles, it was as if José wanted to genuinely connect, to help us understand more of what he has lived. We could never truly comprehend his reality, but we could listen, and we can now share his story. On a humid, sunny day, we rented bikes and rode to El Yunque, a prominent peak on the eastern coast of Cuba. What we expected to be a bird-filled jaunt up a mountain instead transformed into a long discussion. Maybe we asked too many questions about the $13 fee to hike the mountain, but for us, those inquisitions led to a deeper understanding of some of the financial realities. This park ranger put money into perspective. For him, it would take 4 months of his government salary to make enough money to rent a car in Cuba for 1 day alone (about $40). To clarify, the daily park entrance fee for a traveler is $3 more than what each of the park rangers earns in 1 month. Our caffeine-free arrival to Baracoa was met with a gang of bici-taxis ready and raring to bring us to their family or friend’s casa particular. Casa particulares are a more recent way for Cubans to start a private enterprise. Like Candy above, Maídelin rents rooms out of her seaside home in exchange for CUCs. Gratitude filled our hearts when we walked into her colorful casa. This woman’s energy is outstanding - welcoming, generous, kind, and nonstop. Caring for several of her own children throughout the day, Maídelin also goes above and beyond in her hospitable approach to travelers. This little notebook is far more powerful than we could have ever expected - it’s the key to the country’s system of food distribution. Cubans are able to pick up their monthly food rations at the government food pantries, or bodegas, by presenting their libreta. While people today can generally bring home just enough rice and sugar from the rationing system, they often have to seek out other foods like eggs, milk and meat. As travelers in Cuba, we were abruptly awoken to the food shortage reality. “Supermarkets” are a rarity across the country, and if you by chance stumble across one, it generally stocks only cerveza, cookies, soda and water. Motor bikes throughout Cuba are almost as classic as the cars. We walked past this gentleman during the golden hour. He gave a friendly nod and asked if we'd take his photo. I held up my camera, I had 3 frames; this was one. Small street produce stands were one of the only ways we found food, outside of restaurants. Grocery stores were few, far between, and carried extremely limited items. A typical street scene in Baracoa. People would congregate outside of homes chatting and catching up. The pace of life was far slower than what we're used to. The transportation options in Cuba include bicycles, horse carts, bici-taxis, buses and taxis. Colectivos are taxis that travel from city to city or one part of town to another, and load up with as many people as possible. It costs pesos for the locals, but if you can speak the language, you can work your way into a seat for a far more reasonable price than the bus. This particular experience with Omar took us from Moa to Holguín. Traversing the country by colectivo proved an extra rewarding challenge. One of the most powerful conversations we had throughout our journey was with Mario, on a 70 kilometer ride from Santa Clara to Cienfuegos. Our take away from the discussion was the realization that the sole avenue for Cubans to make money is by building their own business. While he has a degree in computer programming, Mario has opted to build his own enterprise as a taxi driver. For he and many others, Mario believes their entrepreneurial spirits will thrive. Everyone belongs to one or more “networks” in Cuba. They’re like webs of interconnectivity that help every Cuban connected to a particular artery capture a piece of the CUC pie spent along a tourist’s passing. This referral system is evident across the country - casa particulares, paladares, taxi drivers, and bystanders all contribute to the channels. We got caught in a noteworthy referral wave in Cienfuegos. A taxi driver, David, drove us toward the bus station. He let us know that he could get us a good deal to Rancho Luna via another taxi driver he knew - Luisito. We had no reservations and zero insight as to where to stay upon arriving at our destination, but David gave Luisito detailed directions to the house of a lovely señora/family friend he knew. While they were booked our first night in town, Luisito did not leave our sight until he had confirmed we had a place to rest our heads that night. Gratefully, we were able to find ourselves at the peaceful casa particular recommended by David the following nights in Rancho Luna. Far from the hustle of the city. Luisito took us over the hills for an incredible escape. This was a public beach in Rancho Luna. Beach goers could order beer and food from the nearby restaurants without even lifting a finger. The prices were reasonable and the atmosphere was perfect. Rainbows apparently frequent this blissful beachside village. Rancho Luna, or moon ranch, has an otherworldly appeal. Set in a microclimate, they rarely sees the big storms, yet often reap the visual benefits. Thriving coral reefs sit just off Rancho Luna’s coastline and the beach fills up with a scattering of both locals and tourists. Lifeguard, waiter, and overall spirit lifter. While staying in Rancho Luna, Sloan was all of these things for us. In connecting with him over the few days we spent nearby, he shared his love for the beach. Over 10 years ago, he left lifeguarding and went back to school in gastronomy to work as a chef. He quickly realized it wasn’t where his heart was. Sloan told us that he was more content living simply on minimal government pay, so he could spend his days with his toes in the sand and the crystal blue sea in his sight. Everyone I ran into told me there was no surf on the Island. Overlooking the bluest Caribbean waters, this mother daughter duo run Villa Busto, their casa particular. Two beautiful souls, Sandra and Lu posses a vigor and motivation to engage with others. Previously a music professor, Lu is overflowing with knowledge of Cuban music, while her daughter Sandra is a flutist. The two prepared some of the most noteworthy and flavorful meals we experienced in Cuba. Our stay in their home exposed us further to the love, pride and compassion prevalent in their country. Two ladies walk the streets of Havana with a bag of plastic water bottles. I didn't ask what they were doing with them and I still wonder. Classic scene of a building in Havana. Classic car scene in Havana. A classic car rips by on the streets of Havana. Cuba’s image in the U.S. is strongly rooted in time warping visuals of vintage American cars, historic buildings and classic street scenes. While there is an undoubted beauty in these scenes, they also reflect more of the local financial reality than our eyes could initially comprehend. Cuba functions on two separate currencies. Cuban pesos, or nacionales (MN), are the money of the people. Citizens employed through the government are paid in nacionales. The other coin, largely known as the CUC (convertibles), was created specifically for tourists and initially set to be 1 to 1 with the U.S. dollar. To put the divide into perspective, 1 CUC = 24 pesos (MN). These extremes in the financial system affect what travelers represent, which can influence the local/tourist dynamic. Streets take the form of auto garages sometimes. Like a scene out of an old movie, a classic car races by in Havana.